(WSBERO/Prague) – Stand up for yourself, for young people, for your National Scout Association (NSAs), for Scouting! 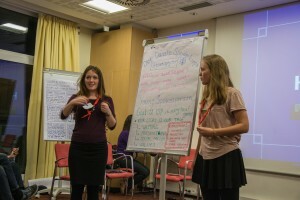 Learning to do exactly this was the objective for 51 participants from 32 NSA in the European Region of the World Organization of the Scout Movement (WOSM) who recently attended the WOSM Europe Young Spokespersons’ Training in Prague (CZ). “The four-day agenda was full of relevant items, each one more interesting than the other”, explains Chrissy, a participant from Bund der Pfadfinderinnen und Pfadfinder (BdP) in Germany. They included story telling, Scouting’s image in society, video training, young Scouts in leadership position, individual communication and empowerment projects. So, how do you get young people to tell the story of Scouting? How do you empower young Scouts in the European Region and aged between 16 and 26 years to take up responsibilities in their NSAs, inspiring others to do likewise and to encourage them to communicate the spirit of Scouting? Fueled by an atmosphere of creativity, the participants expanded their knowledge about the closely intertwined topics of communications and youth empowerment. “Learning how to connect their personal Scout stories to the worldwide mission of our movement was one of the objectives”, explains José, from the European Scout Office, “We therefore encouraged the participants to discuss the development of young people as the central element of B-P’s idea”. Bringing both aspects together, many examples of how NSAs worked in this field were shared, including the PR Labs organized by ZHP in Poland or Det Danske Spejderkorps (one of the Danish NSAs), which offers a full-fledged system of training train young spokespeople on local level. The theoretical and practical excursions culminated in an impromptu flash mob on a public square in the Old Town, with the young spokespeople showing the crowd how much fun Scouting offers. Focusing on how this training could help improve the participants’ areas of interest in their NSAs, they debated and developed future potential projects: for example the establishing of a Scout Youth Council in The Scout Association (UK) or the organising of an Agora event for German-speaking Scouts of the senior age section. By the end of this multi-lateral training that looked at relevant topics from a variety of angles, the participants left Prague not just a little wiser, but also a lot more encouraged to return home to apply their new knowledge in their associations. And that is how you empower young people, one face at a time!